Food and packaging waste was one of the first areas I focused on, and continue to focus on, in a bid to live a less wasteful lifestyle. In the UK, we produce more than 170 million tonnes of waste every year and the majority of that is food packaging. Focusing on the food we buy and how we buy it is a great place to get started when trying to live more sustainably. 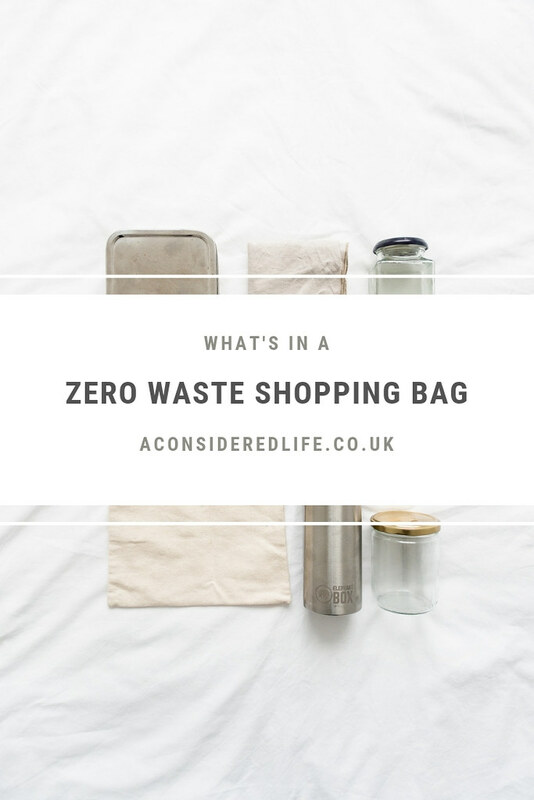 If you’re feeling overwhelmed by zero waste living and you're wondering what exactly goes into a zero waste shopping bag, this post will help you to help replace food packaging with reusables and reduce your food waste. I use tote bags to carry fruit and veggies back from the market and groceries from the supermarket. They fold up small making them useful to have on hand whenever you need one. I’ve made it a habit to carry a spare tote bag with me almost everywhere I go. It’s the one exception I have against the ‘just in case’ mentality. Having a tote bag to hand means I’m not left making the choice between buying in plastic or not buying at all. I find cotton produce bags to be more useful than mesh or nylon bags. I have a set from Amazon and two handmade bags, in a variety of sizes. I use them to carry nuts, grains, and pasta although they’re great for using in the pantry if you ever run out of jars and can even be used as packing ‘cubes’. I use a mix of repurposed food jars, secondhand containers, and IKEA Korken jars. For certain staples, it’s good to invest in specific jars so you can stock up on the essentials. For everything else, using whatever is to hand is my favourite solution. I use jars to store pantry staples, preserve food in the fridge, marinade tofu, and mix dressings. They’re so useful. It’s good to get into the habit of purchasing food in glass containers so you can reuse them afterwards. If I’m heading out to eat, either at a restaurant or street food market, I’ll pack a tin for taking away leftovers or giving to the traders to serve my food in. I have an Elephant Box lunchbox, salad box, and snack pots. They also come in handy for picking up soft fruits, like strawberries, at the market and help avoid plastic punnets, and especially useful for packaging homemade food on trips. Packing cutlery and napkins avoids the need for disposable ones handed out at food stalls and in cafes, just remember to request your order without them. I take whatever cutlery I need from the kitchen drawer and pack a couple of linen napkins; there really is no need to buy something you already own. In a pinch, a napkin is useful for wrapping small food items when you’ve forgotten to bring a container. I carry a water bottle everywhere. I pack either the Ion8 Flask* for shorter trips or the Elephant Box Water Bottle if I'm away from home for longer. Other than keeping you hydrated, having a water bottle to hand is super useful to have as extra storage. Most cafes and bars will allow you to refill with water for free or have your drink to take away in them. But a wide mouth water bottle can also be used as a container to fill up with produce. I’ve used mine to store nuts and grains when I’ve failed to come prepared. My biggest tip for switching to reusable tools is: only buy what you need when you need it. 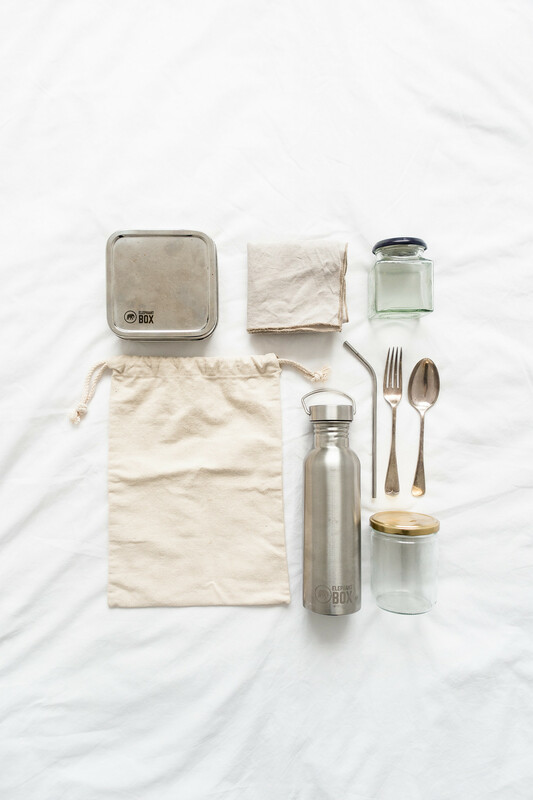 Make use of what you already have, that includes tote bags, jars, tins, and other storage items, as well as cutlery and napkins. Don’t rush out and buy anything until you know you really need it. Most of what I use has been given to me (tote bags), found in charity shops (containers), repurposed (jars), and taken from home (cutlery, napkins). We can’t shop our way to a low waste lifestyle! What do you take shopping to reduce your waste?